I first heard of seed paper–or hand made paper that has real flower seeds embedded in the pulp itself and is actually plantable–about a year ago while browsing through a stationary catalog. It was the coolest idea I’d ever seen–and so incredibly spring-y! Well, who knew that you could make this funky stuff all by yourself? And dang we had a good time! These would be just perfect to include with a birthday or Christmas card–don’t you think? Glue four sticks together–like this. 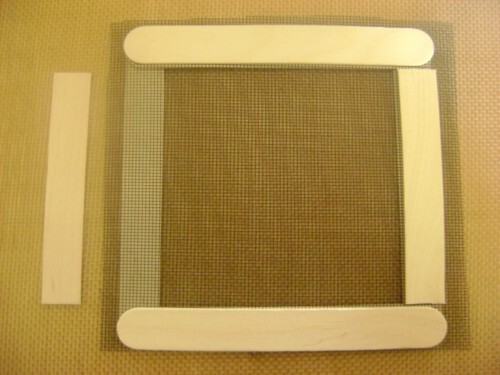 Lay the screen over the sticks and glue in place. Now glue two more sticks–one on the top and one on the bottom. Cut two more sticks and glue in place like this. 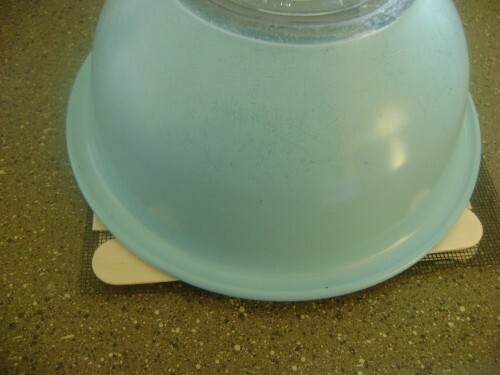 I rested a glass bowl over the frames to hold everything in place until the glue dried. 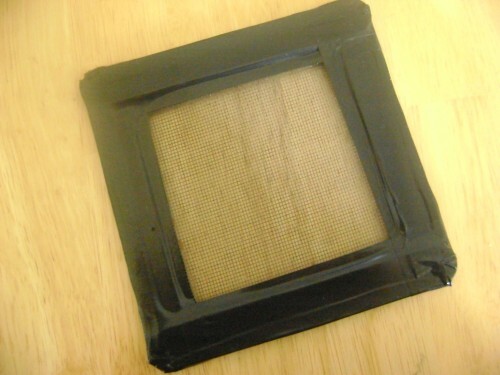 Your frame should look pretty much like this. Now wrap the whole frame with electrical tape, making sure to cover all the exposed wood. and put it in the blender. 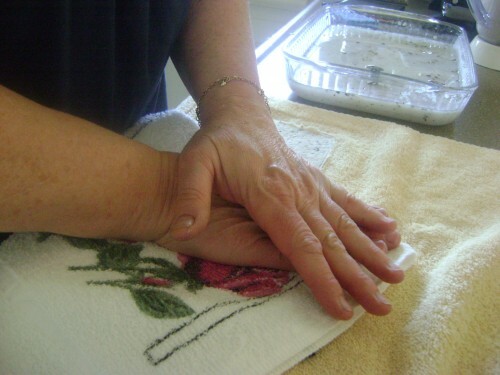 Pour in enough warm water to cover the paper. 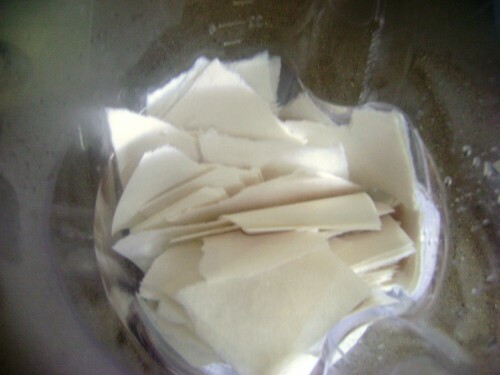 Blend until paper turns to pulp. 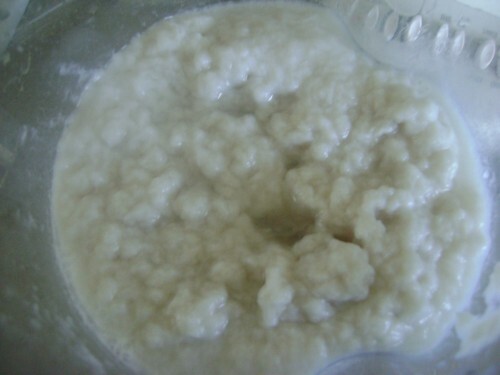 It looks like white oatmeal. If you want to add cut up pieces of hemp twine–now’s the time. Whirl it up. 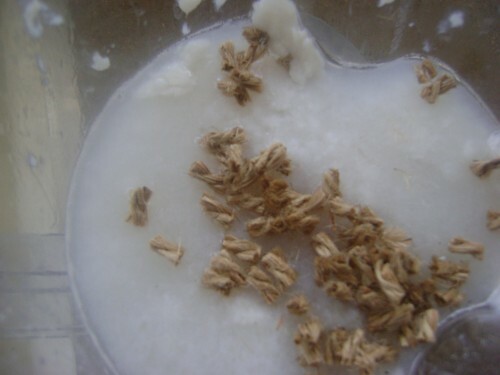 Have your seeds ready–but don’t add them yet. 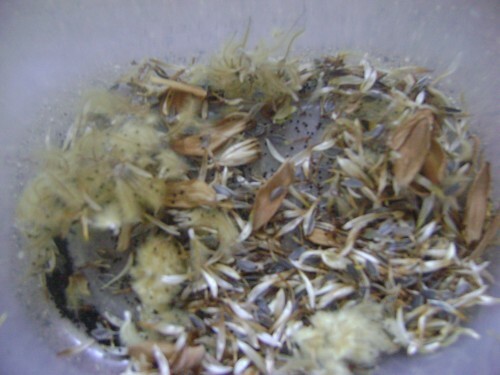 Do not put your seeds in the blender. I probably didn’t need to say that–but you never know. Ok, now fill a 9×13 glass Pyrex dish half full with warm water. Spoon enough pulp into the water to make it like a thin soup. Now add about a couple teaspoons of the seeds. 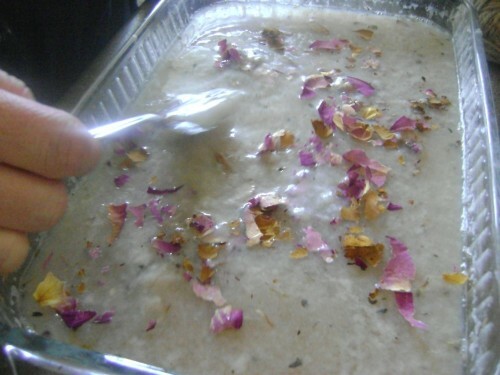 Add the crushed, dried flower petals and a sprinkle or two cinnamon–if you want. Dip your screen into the pulp solution. Move it around like you are panning for gold or something, until there is enough on the screen to cover it. 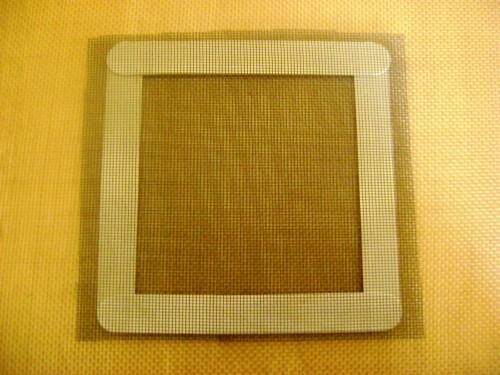 Push pulp from the edges of the frame onto the screen with a spoon or table knife. 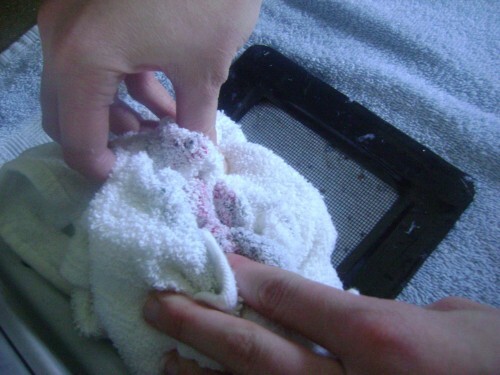 With another towel, press down on the screen to sponge out the excess water. Press for about 1 minute. Now gently lift off the frame. 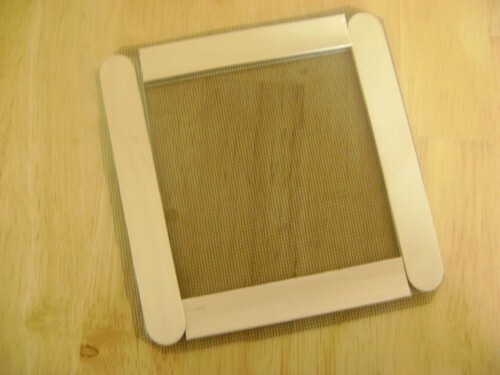 If you have to coax the paper off the frame just go slowly–nudging with a table knife if you need to. 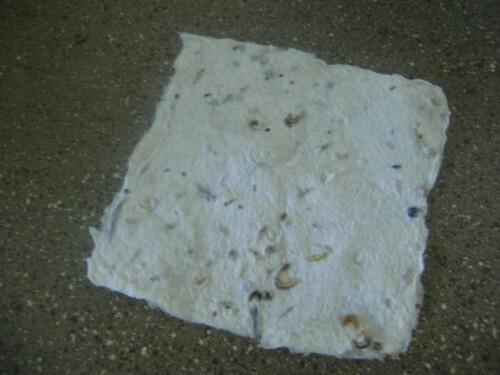 Let your paper rest on the towel until it’s dry enough to move. 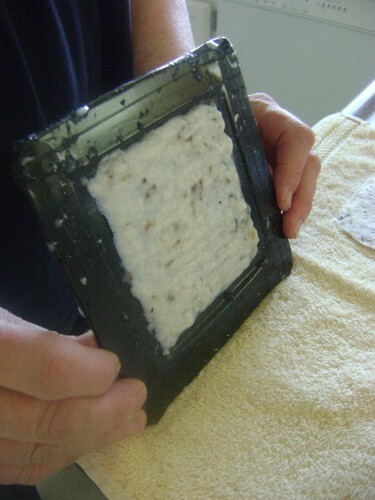 Transfer to a pan and allow to dry all the way–overnight is best. If you’re in a hurry you can use a blow dryer set on low. Once it’s completely dry, tear it carefully in half. Poke or punch a hole in the top somewhere–more in the middle than mine is–and loop twine through the hole–to use as a bookmark. Once you are finished with it you can tear it into pieces and plant it in loose, moist soil–about 1/4 to 1/2 in deep. Now then…don’t you feel clever? Oh, do come enter our EASY “Melissa & Doug Summer Toys” $75 giveaway! We need 200 entries by June 3rd 2011. Please, please–spread the word! So cool! I saw them at your house yesterday. 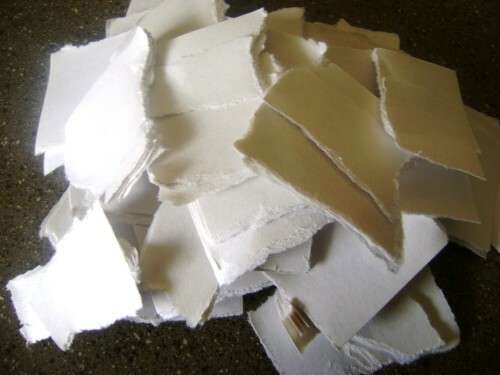 I made paper once when I was in Elementary school. It wasn’t near as pretty. Nice. That is a good gift idea. I should make some for visiting teachers birthdays. I know~ it was soo easy and fun. Even the bald kid made some. It was so great. Thank you–thank you. Boy, I really had to beg for some of those so every one really helped. I’ll post the results soon. In the meantime–you should totally make the paper. It’s incredible. Well, this was so fun and went pretty fast to. I was surprised. We made paper one year for our school co-op (ancient history year). 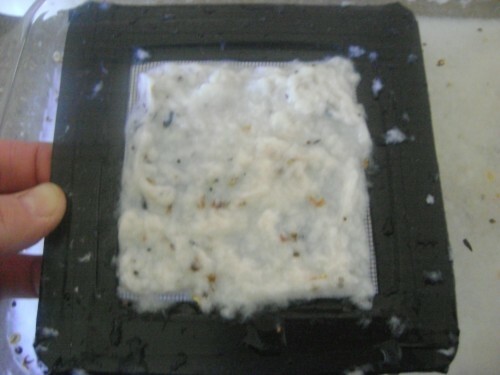 The kids saved dryer lint, thread from the sewing room floor, colored tissue paper etc etc. We made larger sheets (our frame was made with 1X1 wood) and then after studying and practicing calligraphy, they wrote their favorite poem or saying on it. They were so proud and had so much fun and were so glad they weren’t a monk printing a Bible page :). This is SUCH an awesome idea! I love it! I don’t think I’ve ever made paper of any kind, but paper with seeds in it, how cool is that?!? Thanks for the awesome how-to. I’ve seen similar tutorials before but this one makes it look so much easier, the photos and desription are great and I am definatley going to give it a try now. I totally agree that this is one great tut! I, too, have seen this project several times but yours is the easiest one to understand. 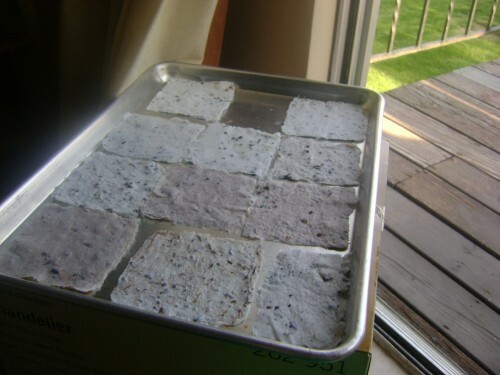 I’ve made recycled paper with my students but I still haven’t done this with seeds. Maybe next year! Thanks for taking the time to do this and for publishing for us to us. Have a great day! It would make great gift tags–I think. We need to plant some and get an idea how to spread it out. I’m thinking it would be best to tear it up first. Welllllll….I don’t seem to be able to keep quiet very well, and I can’t resist Cheetoes, and I can’t balance my checkbook. I could go on and on. Do try it. The instructions I originally had made quite a mess. So we tweaked it and it turned out easy and so great. You’ll really enjoy this. The seeds just make it feel so worthwhile. Just think, even if it ends up in a land fill someday–it has the potential to make something beautiful again. That makes me very happy. I hope you try it. We’re going to add little dried Forget-me-nots next time. This reminds me of the days of watching Reading Rainbow except they made their paper out of recycled jeans. Who knew people were so environmentally conscious in 1995? although I’d suggest you mention recycling paper ): like grabbing up all that junkmail that gets thrown out and make paper with it. when I was younger we used old newspaper and left over scraps of construction paper to make new sheets of paper, and the ink washed out so it was really just colourful. I agree wholeheartedly–so I’ll change that right now. I have been searching for this………so glad I found it. I have seen such paper used as a funeral memorial. Nice work. If I’m reading this correctly, can this be used for growing seedlings? I’m with you. I’ve changed the paper to be a bit more earth friendly. Thanks for the nudge. I love it. Awesome! I think I might try this some time this summer. I might make some thicker paper so I can write on it for home use, then once I’m done with it, plant it! Great tutorial about seed paper. 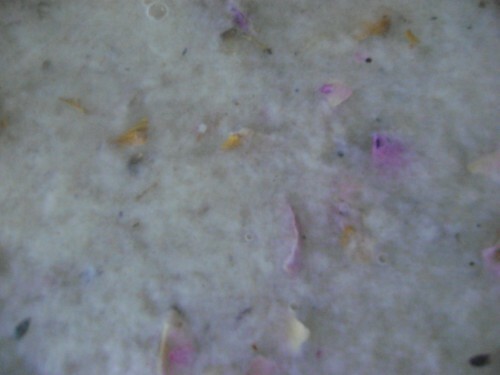 I stumbled across another site where a big company put seed paper through their printer and made a mess of their printer with all the seeds falling off. I thought it was funny, cute and neat and wanted some. Then I stumbled across your site. Thanks. I’ve added a link on my site to yours. Keep up the good work. Pingback: tell me now what you know about dreams « shake rattle. Why don’t you just buy paper and save the hassle? This is brilliant! I have an online crafts store and I’ve been searching for a nice little free gift to include in my packages. Because my packages must weigh under 13 oz to get the cheapest postal rate, these lovely flower seed bookmarks are a perfect solution. Thank you for the tutorial. I like the stick frame. I made the paper with my second grade students using embroidery hoops for the frame. The students wrote a Mother’s Day message on the paper. I just found your great site. Keep up the great work. Great tutorial! 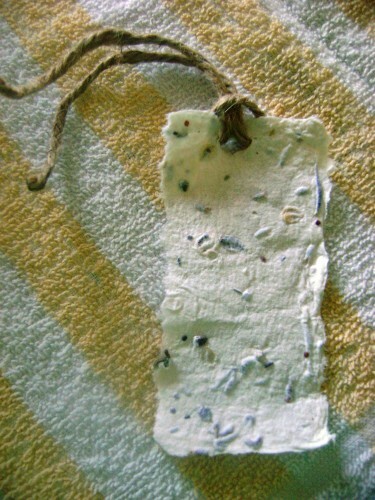 Using the white paper looks beautiful, but I want to make this paper for Christmas gift tags. Any idea how it would look with red construction paper? Just as pretty? I’m looking for festive. Thanks! Beautiful, Our local council made artistic postcards with seeds with different seeds from herbs, I’ve planted them and so far nothing has grown yet, but the weather is weirdly cool for Oct in Australia. Makes beautiful textured paper. Maybe wheatgrass or beansprouts would be good for kids cos they grow quick. I used snapdragon, marigold, and a wildflower mix that I had. Guess I’ll have to plant another one and post the pictures. Tell us how your idea works–I’d love to see it! Oh, I’m sure it would be lovely! I’d love to see a picture of the end result. Are you making them now? I’d love to see them! 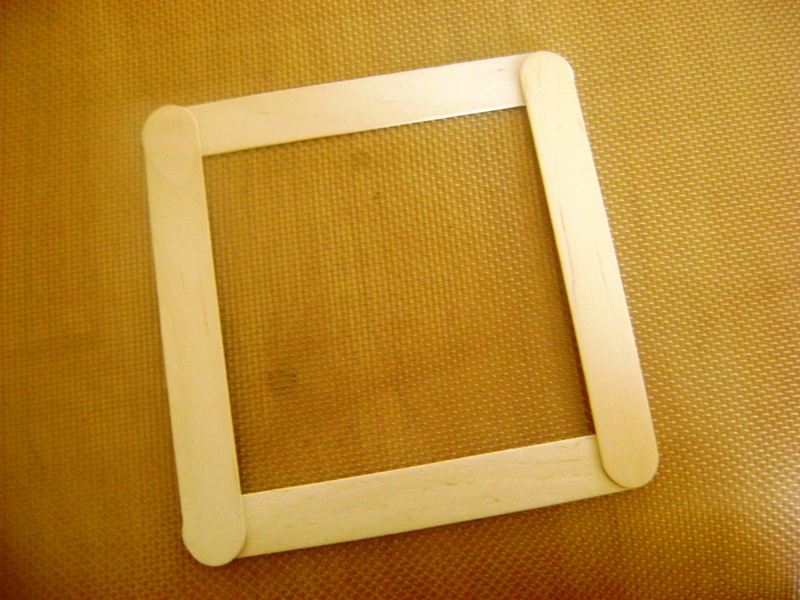 you could use this to make letter shapes in your garden byt making letter shaped paper. You can also add things such as cut up ribbon (small pieces), crayon shavings, and pretty much anything that is little and pretty. Cut open tea bags produce a really beautiful result. Also, if you are planning on making A LOT of paper you can get a big plastic tub and vary the size of your screens. Empty wooden frames can work very well. But please be careful with which seed one chooses. Many plants are invasive and many commercially available wildflower mixes have invasive seeds as part of their mix. Oh, I’ve seen that too. 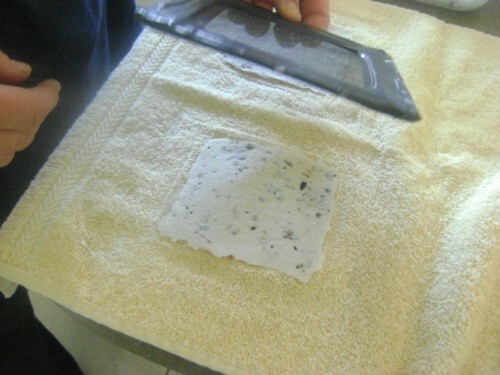 You have to use teeny, tiny seeds though or when the paper is pressed it will damage the seeds. What an adorable idea! It would especially work great if you were using the same type of seed throughout–so they’d be the same size and shape. Wowwww….maybe some day I could get my carrots in an actual straight row with this stuff! 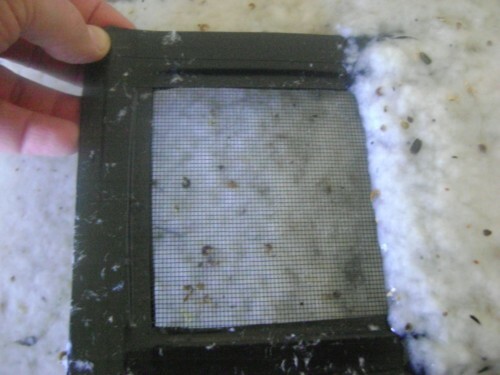 You can use a small, intact window screen too. That works well. Be sure when adding different tiny pieces of things that they aren’t something that will leech chemicals or strong dyes into the mix. It could screw up the seed’s ability to germinate properly. GOOD, good point LennyP. I’m not a fan of Morning Glory for that very reason. In Utah it’s seen as a weed–WE HATE It. But I’m amazed to see it in tons of commercially packaged wild flower mixes. I used my own seeds from our yard–that way, I was certain what EXACTLY I was working with. Thanks for a great tutorial! My freshly made paper is drying right now. 🙂 I ended up using plastic needlepoint canvas for my screen. 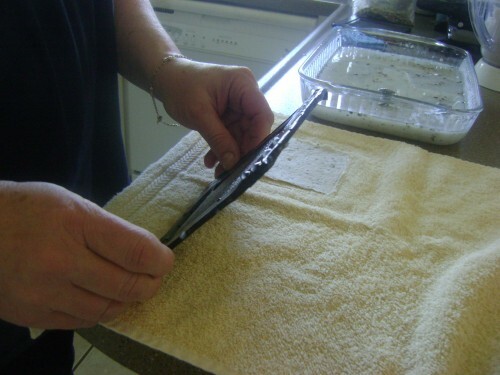 It worked great and was easy to cut to a usable size! That’s a fantastic tutorial! The paper is absolutely beautiful. Something I’m definitely going to do! This is wonderful! I would love for you to share this project on my Inspiration Board. I want to make this for wedding favours, does anyone know if can they be made in advace (6-8 weeks) or does the wet pulp start germination? No, I’ve kept mine for nearly a year now and they’re fine. They aren’t wet long enough to germinate. You are adorable! Thanks so much for your kind words and I’m positively thrilled that you love this idea. It was incredible fun. I hope you’ll stick with us. We have a ton of fun around here. Thanks for reading! Have you tried planting these yet? How long until germination? How many plants sprouted (and/or lived) from one strip? Thanks! 💡 All of these ideas are great! We are having a Celebration of Life for a close friend, and to honor her memory we wanted to hang book markers on a potted tree as gift for the guests. She was a gardener and love to read. So we have decide to make the seed paper bookmarks, But instead of using flower seeds we are going to use Herbs and trace her grandchildren’s little hands and cut them out and attache them to an instruction card with a special quote. Does any one know or has anyone tried to make 8 1/2″ x 11″ seed paper and use it to print on? Would like to use the paper to make the programs. Did this with my kids for Spring Break Camp. We made our screens a bit larger cause we had some scraps of wood to use up, but followed everything else. Thanks for the tutorial! Before we did the tutorial, I found some printable seed paper online at Botanical Paperworks. Not sure if it’s too pricey to be practical or not. But it might be worth checking into. I plan on making as much of this as I can for my wedding invitations! Going to try to get a good color with some crayola markers (which are non-toxic), and use vellum paper as an overlay. Can’t wait! Thanks for the great idea. This paper is just what I’m looking for for my wedding save the date cards! Can the paper be printed on, from a home printer? Has anyone tried that? I’m looking forward to making it! I was looking for some seeded self-promo for my eco-friendly promotional products company, but wasn’t finding what I needed from my current suppliers. Dang it I’m not motivated now, to make my own! Your tutorial is REALLY great, and easy-to-follow and, as such, is truly inspiring. Ha! Oh, how a typo can change an entire sentence/sentiment! Thank you again for this awesome, easy-to-follow tutorial!! Also, for seeds I think it’s a great idea to use local wildflowers (or anything that isn’t invasive). The bees will be so happy in the spring! How did the paper come out after you planted it…you promised you would keep us posted 😯 does it look cool?? but I know I am getting knowledge everyday by reading thes fastidious articles. Studying this info So i am glad to express that I’ve a very just right uncanny feeling I discovered exactly what I needed. I most certainly will make certain to don?t forget this web site and provides it a look on a relentless basis. Thanks for the great idea! I’m thinking of these for seating cards for my wedding (that we can also provide as favors) – my question is, do you know if it’s possible to write and/or stamp this sort of paper? Would ink mess up it’s ability to grow afterwards? Were you able to grow the paper later? Could you recommend which types of flower seeds would be best? The paper is a bit bumpy so you might want to paste an insert card on top with the printed material and have the seed paper be the backing. I don’t really know if ink would mess up the seed’s ability to grow so using an insert might be the answer to that too. Your guest could just remove it. I tore mine up and spaced it out a bit before I planted it so that I didn’t have a big knot of flowers in one spot. I found the Alyssum, Marigolds and Snap Dragons worked well if not planted too deeply. I used those three and a wild flower mix in mine and those did the best. Let me know how it goes. Did you use Electrical Tape or simply Duck Tape? I can not find electrical tape over 3/4 of an inch wide. Wondering if you used a few rows of electrical tape or one piece of wide duck tape? Thanks! Seed bombs are super easy, and essentially the same thing as seed paper…. Only difference is, you make balls instead of flat sheets. So, take away the screen step,maybe add a little less water. Takes forever to dry! But fun to make outdoors, with kids,etc. Thank you for generously sharing your tutorial! This is really cool! Going to try it soon! strategies you can use to promote your online business. so called expert onn every page you look at. I know I’m late with a comment and question. I love this idea and pinned it a while ago as I think it’s a great gift. 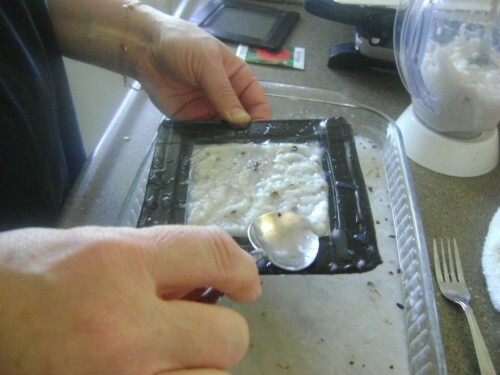 My question is don’t the seeds get wet and start to germinate when put in the wet paper? Just curious.